We’ve all heard the stories and read the books about pets that have disappeared from their new homes and travelled literally thousands of kilometres to their old familiar stomping grounds. Moving is a very emotional and traumatic time for everyone. Your four-legged, feathered and fishy friends are just as likely to be upset by a move than any human members of the family. If you’re planning a move, don’t forget to prepare your pets for the change. Hopefully you’ve done it anyway, but have your pets micro-chipped and have a name tag on their collar, If they do wander off from your new home , it’ll make it much easier for you to trace them, or for anyone who picks them up to return them to you. Take photos of your pets. If the worst happens and they do disappear, you may have to make posters. A picture of your 12-year-old senior citizen as a puppy or kitten is not going to help you find him. Visit your vet to discuss the move and to get their immunisation and health certificates up-to-date. He or she knows your pet and may prescribe a tranquiliser if your pet doesn’t take well to disruption to their routine. Update their collar disc with your new address and contact details. There’s no doubt that your dog or cat is going to be very unhappy with strangers trooping in and out of your house on moving day. Your front door is also probably going to be open for most of the day, making it easy for them to slip out unnoticed. 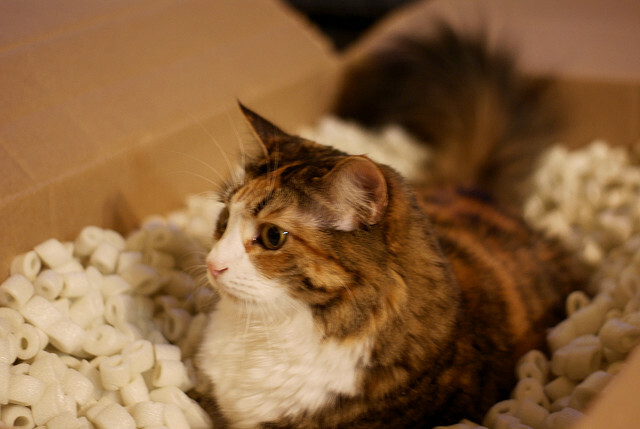 Ideally, ask someone your pet is familiar with to take them on moving day. If that’s not an option, it’s best to set aside a room where you can confine them with their bedding a good supply of food and water and their favourite toys. But don’t make the mistake of plying them with food treats. The change in diet and the stress can result in a bad tummy, which is just going to add to your anxiety levels. Cats are curious creatures, and are likely to find boxes a source of interest, and you certainly don’t want them boxed up with your frying pan or lounge cushions. If your pets aren’t used to the car, start taking them on short trips a few weeks before your move to acclimatise them. Also get them used to be transported in a pet carrier. Start with confining them for a few minutes and gradually build up the time, especially if the drive to your new home is a long one. A lot of dogs and cats suffer from motion sickness, so have a chat to your vet on how you can keep them calm or to prescribe something. If you’ve got a bird or two, you can transport them in their regular cage if your new house is only a short distance away. Remember to remove any hanging toys like mirrors or swings from the cage. The motion during the journey could literally knock your bird off their perch. Don’t travel with food and water in the cage, again the movement of car will spill them and create a mess. If your journey is going to be longer, invest in or hire a special bird carrier. If you own fish, some planning is needed to get them to their new home. First of all, you can’t transport them in their tank for practical reasons – the water is likely to make it too heavy to move and it could break in transit. The best option is to buy special plastic bags from a pet or aquarium supply shop. These bags are stronger than your average sandwich bag and are elongated to allow an air pocket at the top. Use the tank water to fill the bags to ⅓ (anymore and there won’t be enough air for the fish). Also try to save about 80% of your existing tank water so they have mature tank water when you refill the tank. Once the fish are in the bag, fill the remainder with air. Don’t breathe directly into the bag as you’ll fill it with carbon dioxide. Breathe out with your mouth about 25-30cm away from the opening. This will move air into the bag. Then tie off the top with two strong elastic bands. Doubling bagging the fish will stop leakage. Fish can go for a few days without eating, but won’t survive the trip in a bag that is full of their waste. So don’t feed them for a day or two before your move. Place the bags in a cooler to keep the temperature of the water regular. Pack the bags tightly into the cooler so they don’t fall over. When you’ve set up the tank at your new house, float the plastic bags in the tank to equalise the water temperature, before releasing the fish. Unpack some of your furniture in your new home before you introduce your dog or cat, so they are greeted by familiar sights and smells. Let your dog explore your new garden, but make sure the fencing is secure. Take them for regular walks around the neighbourhood so they get used to the new space. In the case of cats, keep them indoors for a few weeks, making sure that the windows and doors are kept closed so they can’t escape. Once you’re comfortable that they won’t take off, let them outside for a short time. If they are reluctant to come back in, entice them with a treat. Although you’re going to be very preoccupied during your move, spare some time to plan for your pets. No move is completely stress-free, but happy, contented pets are going to contribute making it less so, and make the adjustment to a new home easier.